Web of Science: Do elves exist? There have been beliefs in other types of people inhabiting the earth alongside mankind but invisible to their eyes ever since stories began. Stories about how they lived, their dwellings and dealings with the human world have been passed down from generation to generation. Those who are endowed with special gifts may even be able to catch an occasional glimpse of these mysterious fellow-travellers of ours. Ideas of this kind were formerly widespread throughout the world, the beings in question being known under many different names and described in different ways. Across the whole of northern Europe there were stories that presented a similar picture of them, in human shape or very like it, with farms and animals, at home in the landscape, and considered to have greater magical powers and a more spiritual nature than ordinary human beings. Up until the beginning of the last century such beliefs were alive and kicking among the peoples of this cultural area, but as the 20th century progressed they lost more and more ground to a different world view, one that science and the arts, politics, technological advance and religions all conspired to promote and reinforce - the modern vision of nature of Western civilisation. As things stand, with the exception of a few places in Ireland, the last refuge of the elves and hidden people in their ancient sphere of influence appears to be in the Icelandic landscape and in Icelandic hearts. 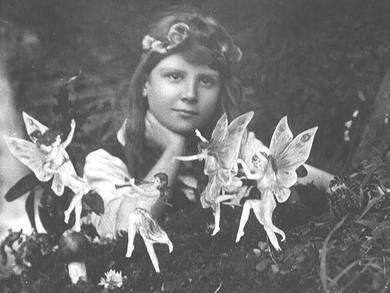 The Cottingley fairies, a famous fake picture. In July 1998 the newspaper DV put a piece of news on its front page that came as a bit of a shock to many of its readers. It was reported that, according to an opinion poll conducted by DV, the majority of respondents in a random sample of the Icelandic nation, when asked whether they believed in elves, answered yes. The results showed that men split more or less half and half between the yeses and noes, but significantly more women said they believed in elves than did not, or 6 out of every 10. The responses were also compared with political affiliations. It came out that the supporters of most parties divided pretty much down the middle between believers and non-believers. To this, however, there was a notable exception in the case of supporters of Framsóknarflokkur (the Progressive Party, with strong support in rural areas); of these, a large majority, or 64%, said that they believed in elves. But this is by the way. The poll in DV was flawed inasmuch it only gave people the option of answering yes or no. The truth is considerably more complicated than such options permit, and in fact older surveys of the same subject show that the overwhelming majority of people in Iceland simply don't know. The question presented here, Do elves exist?, is aimed at the very heart of the matter as concerns the ideological tradition of belief in elves nowadays. The ideas about elves that feature most prominently turn around the element of uncertainty that persists in the world view of the present age. Very few people believe that they have all the answers at their fingertips, nor would they claim to have the mystery of life sorted out once and for all. The few of us who do know everything (in their own estimation) can answer the question about the existence of elves with a straight yes or no; but the rest of us have to admit that there may be more things in heaven and earth than are dreamt of in your philosophy. Elves are the embodiment of this uncertainty. We have, in other words, more questions than answers, and this question is among them. See also Gísli Sigurðsson's reply to the question What are popular beliefs, and how do popular beliefs in Iceland differ from those elsewhere in Scandinavia? Valdimar Tr. Hafstein. „Do elves exist?“. The Icelandic Web of Science 27.1.2006. http://why.is/svar.php?id=5597. (Skoðað 21.4.2019).